What does dank meme mean? Dank meme refers to viral internet content that, due to overuse or passing trends, has lost its value or currency. It can also refer to exceptionally unique or odd memes. Where does dank meme come from? The phrase dank meme first emerged in 2013 on message boards within 4chan and Reddit that were dedicated to making parodies of existing memes and mocking meme culture. Spreading in 2014–15, the term dank meme rose to mainstream prominence with a Facebook Group, Bernie Sanders’ Dank Meme Stash, which churned out memes supporting Democratic candidate Bernie Sanders during the 2016 US presidential election (internet users frequently refer to a collection of dank memes as dank meme stashes). In May 2016, an Australian journalist drily defined dank meme on a broadcast, much to the meta-delight of many internet users. The dank in dank meme is an ironic use of the slang term dank. According to lexicographer Jonathon Green, black, campus, and drug slang began repurposing dank—which originally meant “unpleasantly moist or humid”—as “excellent” or “first-rate,” especially with reference to high-quality marijuana, in the 1980s. Dank meme stash, as we saw, additionally alludes to the marijuana sense of dank. 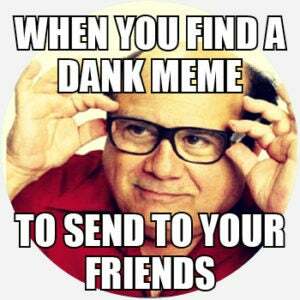 Still, as its irony wears off thanks to its own use, dank meme continues to evolve, referring to memes that are delightful, clever, or funny on account of their weirdness, obscurity, novelty, and idiosyncrasy. A constant engine behind dank meme, whether used negatively or positively, is content that hasn’t gone viral in the mainstream.